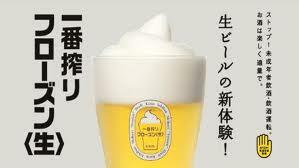 Japan’s Kirin Brewing company is unveiling its “Frozen Agitation” process in Tokyo next month. Will beer ever be the same? Ah, technology. Thanks to its ever-expanding capabilities, we can chat with monkeys, make Jell-O sing, and even share with the world the site of our latest sexual conquest. And soon — O, Lord, yes — we’ll be able to enjoy soft-serve beer sorbet. Poor beer. That sounds harsh, doesn’t it? But it’s all in the name of flavor, and so the beer, we suspect, would not mind very much. It seems the venerable Kirin Brewing company has developed this novel process to keep beer chilly. A special tap fluffs the head of the beverage and cools it to 23 degrees Fahrenheit, transforming it into a cozy cap to keep the cold not out but in. And this soft-servey cap, we hear tell, can be eaten. Yum.